What is a nüz/böx? First, it’s spelled with an X, a Z, two ümlaüts and a slash/. Even the name calls your attention. The pronunciation of nüz/böx is intentionally ambiguous. How do you pronounce it? Pronunciation, like many aspects of a nüz/böx, is something the curator(s) – which is you if you decide you want to do it – give(s) form and direction to. A nüz/böx is purposely designed along minimalist lines, of concept, architecture, labor, and materials. It’s easy to do. “Is the nüz/böx part of a movement?” It could be, but it doesn’t have to be. It’s what you want it to be. Maybe you’re an artist and want a small way to display what you do. Or a craftsman and want the nüz/böx itself to show your chops. Or you’re a social worker and want to try outreach in a new way. A teacher may want to help kids and adults learn something. Perhaps you aspire to public office and want to test the waters with your ideas. Fill in __________ the blank with your great idea. The nüz/böx builds on several traditions. There is a long history of precarious libraries. People always carried books with them, even in a mobile nation like the United States. Neighbors trade books. There’s the modern, yet edgily nostalgic Little Free Library movement (http://www.littlefreelibrary.org/), if you just want a library. Very cool ideas there to build – and a good movement to join, too! Then there are the wayside shrines of the world, where their peaceful and welcoming nature expressed through many different beliefs suggests something to help heal things needing healing. But I’m an Indymedia activist, living in an active media town, Urbana. I had other things I wanted to address, like where do you put lost cat posters if it’s not legal to put them on sign posts? Sometimes I want to put out something interesting to read. Imagine the possibilities. So I did. The neat thing about the nüz/böx is that it’s mostly 1st Amendment justified. I did want an exchange library and I think this is a vital part of the concept. 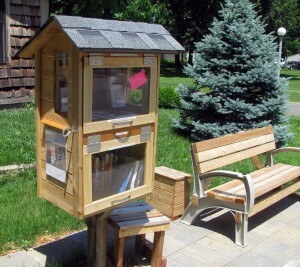 My edgy political stuff is probably outside the circle of the rather non-political Little Free Libraries, although they give off a cozy upper Midwest anarchist vibe. I basically wanted a miniature Independent Media Center. You don’t need to have an IMC in your nüz/böx, though. Just fill in  __________  the blank above. Do your own thing, join with others in your own network, or drop me a line through the contact below. What’s in my nüz/böx? There are books occupying the library. Dozens of books have come and gone, but it’s never empty. In the upper half are the Public i, maps of Illinois and Urbana, the C-U Bike Map, literature about the IMC, info on the Urbana artist grant program, and – recently – a small show of support for Edward Snowden. I believe it’s important everything in a nüz/böx is either free or in exchange. That money thing is way over-rated. This isn’t a vending machine for media or art, plus that would likely require a variety of other permits, taxes, etc. There is a hook to hold your grocery bags while browsing the nüz/böx and a leash latch if your dog is along. Nearby is a refuse container and a bench on a small plaza. It’s a rest area for your mind. The nüz/böx was made of some recycled materials and some new. The main thing you want is a water-tight nüz/böx that is easily accessible, yet still has a little ventilation. I mounted mine on a post; just make sure it’s solid. Make windows into it, as seeing into the nüz/böx attracts people; only use acrylic or lexan plastic or other safe glazing materials, not window glass. The backside has an area covered by clear flexible plastic for posting neighborhood notices. As curator, I manage the page-size display space on each side. Just ask if your cat or dog is lost, I’ll be glad to put your flyer up. Remember to keep it neat and check on it daily to tidy and reshelf books. Light is important, as you’ll want people to be able to see in after the early wintertime sunsets. Take advantage of a nearby street light or go solar. For relatively little expense, adapt a solar powered yardlight set to light your nüz/böx. In Urbana, a nüz/böx like mine requires no permit. It’s generally a good idea to contact the community development department and have them take a quick peek at your plan in any case. It must be located wholly on your property; any open doors or other projections should not intrude on the city right-of -way. If you want a plaza adjoining the sidewalk, there is usually a ROW permit required ($75). The month since the soft opening indicates the nüz/böx is a hit with everyone, from kids to librarians. Literally hundreds of people have stopped, looked, swapped books around or just said, ‘Great idea!” A nüz/böx is a great way to interact with neighbors. You can spot the first nüz/böx on East Green Street in Urbana. This entry was posted in Community Forum, Education, News, Uncategorized. Bookmark the permalink.